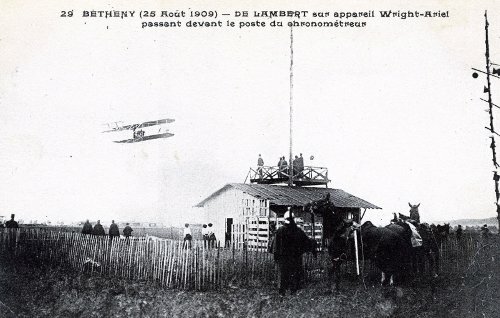 During all summer of 1909 Charles de Lambert is hopping from one field to another, flying continuously. 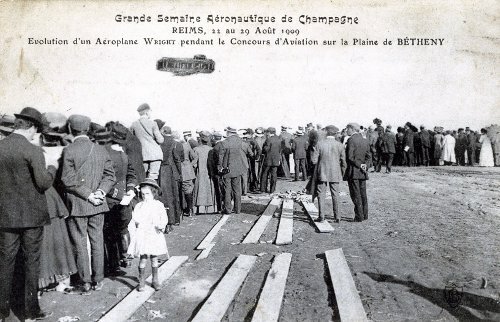 Thus he finds himself from the 22nd up to and inclusive 29th August 1909 on a rectangular flat plain of ten kilometres in Bétheny near Reims where in rain and wind the ‘Grande Semaine d’Aviation de la Champagne’ (‘The Champagne Region’s Great Aviation Week’) was held, sponsored by ‘grandes maisons qui font de la gloire de la Champagne et de la France’ such as Maison Bollinger, Maison Mumm and Maison Pommery. 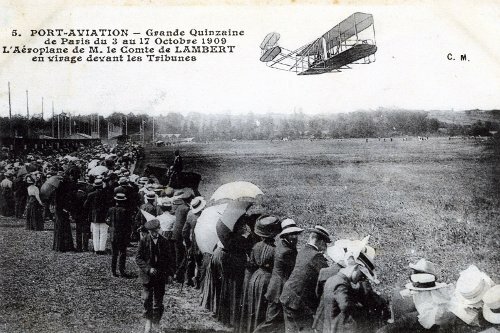 It is a landmark in the history of the heavier-than-air flights: the first true international air meet of its kind with twenty one participants including Blériot, Curtiss (representing the U.S.A.), Delagrange, Farman, captain Ferber (because of military rules always flying with the pseudonym de Rue), de Lambert, Latham, Lefebvre (playing rather ‘break-neck stunts’ with his machine and stealing the show), Paulhan, Sommer and Tissandier. The final day there are no fewer than 250.000 spectators who can see that the experimental phase in aviation is over! Wilbur and Orville Wright, both in Europe, decline participation at such an “frivolity”. August 30 1909 Orville flew in Berlin on the Tempelhofer Feld for the first time above German territory. Charles de Lambert reaches the speed of 60,521 kilometres an hour (5th ranking for the speed prize) after covering on Thursday August 26 1909 on a closed circuit 116 kilometres in 1 hour 55 minutes, with which he comes in 4th in the ‘Grand Prix de la Champagne Distance Prize’. Finally, official recognition is given when on October 7 1909 on the proposal of the ‘l’Aéro-Club de France Commission Sportive Aéronautique’ he is awarded the brevet of pilot-aviator. His brevet has number 8. Sometime afterwards Paul Tissandier will receive license number 13 which, no doubt on account of superstition, will be changed later in license number 10bis! 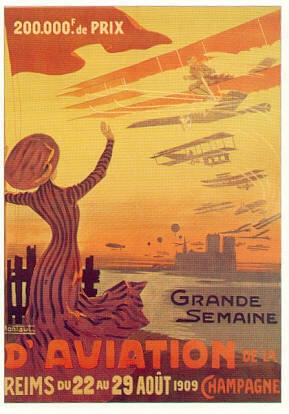 From Thursday October 3 until Thursday October 21 1909 the ‘Grande Quinzaine de l’Aviation de Paris’ takes place on the 1st organized aerodrome in the world of Port Aviation (Juvisy-sur-Orge) – exploited by Société ARIEL – opened in Viry-Châtillon (in the neighbourhood of Paris) on January 10 1909. Charles count de Lambert is out for a sporting revenge without any financial reward after his failure of the Channel and wins almost all prizes. So he takes off from Port Aviation at 16:37, ventured above the stony ocean of Paris, flies as far as the Eiffel Tower, rounds it at a height of about 400 metres and returns to his starting point in Port Aviation after a flight of 48 kilometres, in 49 minutes and 39 seconds. After a first telephone call at 17:10 from the Avenue du Maine and a second one at 17:20 have warned Juvisy that a machine is flying above Paris and passes by Place Saint-Michel in the direction of Port-Aviation, nobody can believe it, the crowd gasps for breath and storms enthusiasticly to the machine of Charles de Lambert appearing at the outskirts of the field. 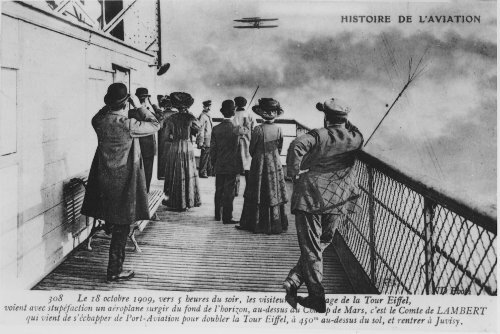 Gabriel Voisin, in 1906 together with his brother founder of the first airline company in the world Les Frères Voisin, is at Rungis at the moment of the heroic deed. He remembers being very astonished, having raised his head hearing the whirring noise of an engine in the air and, to his unbelief, having seen the biplane at a height of about hundred metres.